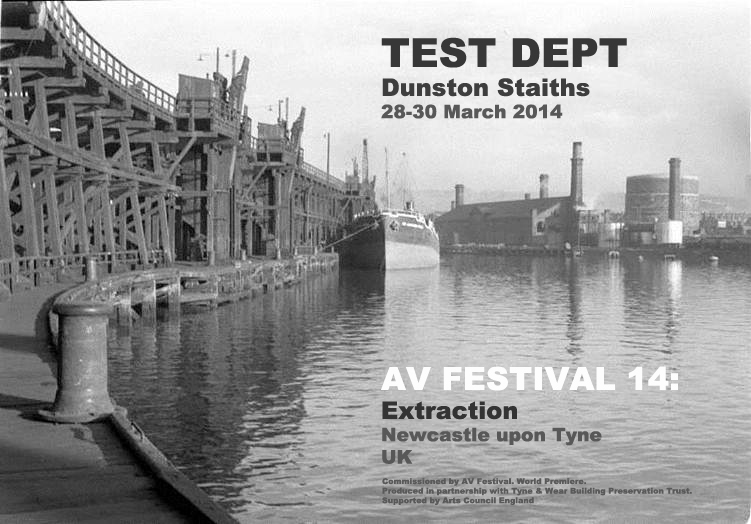 Test Dept return for an AV performance marking the 30th anniversary of the Miners Strike. 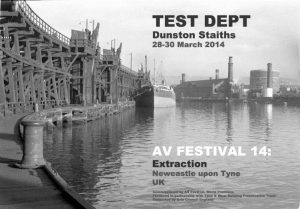 Test Dept bring the drama and noise of the monumental Dunston Staiths back to life in a vital sonic, cinematic and lighting intervention. Viewed from boats on the River Tyne over three nights, the event marks the 30th anniversary of the Miners’ Strike. Seminal industrial music group Test Dept returns with their debut event since they disbanded in 1997. This large-scale outdoor event takes place at the dramatic Dunston Staiths, reputed to be Europe’s largest wooden structure, which was built on the River Tyne in 1893 to ship coal from the local Durham coalfields to the world. Correction to previous advertised dates. The event takes place over the three nights of Thu 27 March – Sat 29 March 2014. Three slots are available each evening at 6.45pm, 8.15pm and 9.45pm. This entry was posted in News, news-test-dept on March 3, 2014 by Peter Webb.